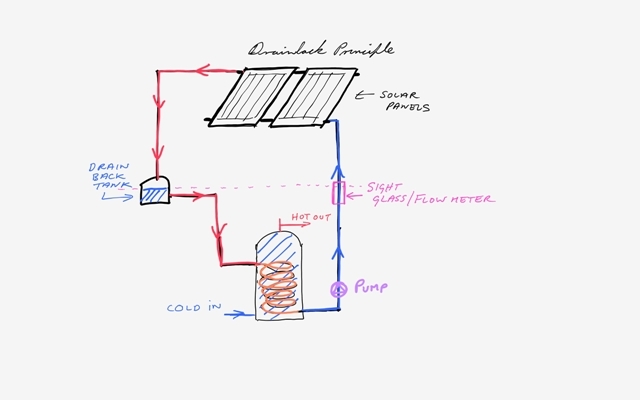 There are two basic types of solar hot water systems that collect heat from the sun to heat water. One is called a Drainback System and the other is called a Pressurised System. The disadvantage is that it is not typical in Ireland and it requires correct installation. There are commercial and domestic drainback systems. The system I intend to use is a domestic unvented drainback system. 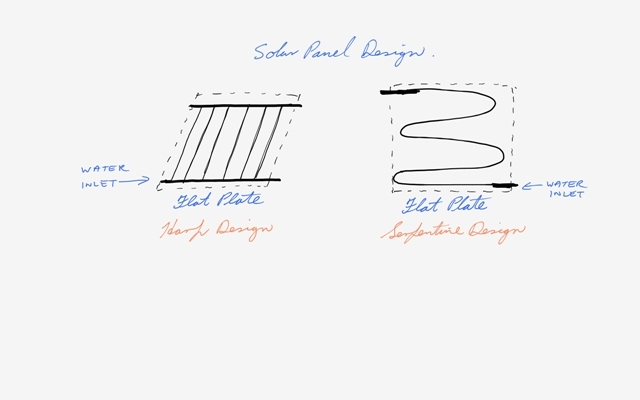 The choice of solar panel is important-the drainback system requires a flat-plate solar collector panel using risers (vertical pipes in the layout of a harp design-see sketch below) of around 12 mm (this might be a challenge to source). Water (pure or non-hardened) with no glycol is used. Water is a better conductor of heat thus the efficiency is better (we need all the help we can get in the Irish climate). Vacuum tubes are typically not available for use with the drainback system. My view on vacuum tubes is that they are equivalent to light bulbs on your roof (they use the vacuum principle like light bulbs which means they can fail). So from a cost point of view and maintenance point of view they are not being considered.